The NMFMA currently provides two sources of funding to help markets reach their communities and become sustainable sources of fresh food access. Funding can be spent for any kind of promotion, outreach, or marketing efforts that will help educate the community about your market. Feel free to get creative! If you're unsure about whether your promotional ideas will be covered or what type of proof you need to submit, contact the NMFMA at questions@FarmersMarketsNM.org or (505) 983-4010 x 2. Every market receives a base of $300 and an additional $5 per vendor *. You must use the same peak average number that you use to calculate your membership dues and annual liability insurance. * The NMFMA provides $5 per vendor for all agricultural vendors and for arts/crafts vendors totaling no more than 25% of the total number of vendors. For example, if a market has 40 vendors and 20 of them are non-food vendors, your market's available funding will be based on 30 vendors- 20 agricultural vendors + 10 non-food vendors (25% of 40)- or $300 base + $150 = $450. 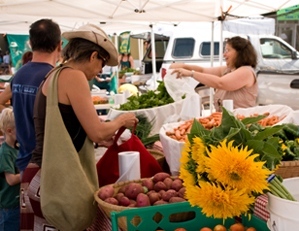 We understand that markets often benefit from having arts/crafts vendors, but the NMFMA encourages having a market with no more than 25% non-food vendors to maximize the community's access to fresh, local food, and to keep the emphasis on farmers in our farmers' markets. ** The only current exception to this rule is the Farmers' & Crafts Market of Las Cruces, which has hundreds of non-food vendors. This market receives promotional funds ONLY for agricultural vendors. To be eligible to receive promotional funding, markets must be members in good standing of the NMFMA, including paying membership dues, submitting the market's membership form by April 1st and providing annual market data by the deadline. The membership application contains information for estimating your market's available NMFMA funding. When you send in receipts for reimbursement, please send check-in copies of ads, radio copy, or photos of signage, displays, posters or other promotional material. No exceptions. Payment: Promotional expenses are generally paid on a reimbursement basis. You may also have the vendor (sign-maker, newspaper, radio station, etc) bill the NMFMA directly. Please contact the NMFMA in advance so that we know to expect the bill. We like to receive these bills promptly to maintain good relations with your vendors. Logos: The New Mexico Department of Agriculture (NMDA) "Taste the Tradition" logo and New Mexico Farmers' Markets logo are encouraged, but not required. Deadlines: Submit your estimates with our annual market membership application by April 1st of each year. We prefer to provide reimbursements in one or two payments. All funds must be spent and submitted for reimbursement by November 15th of the year awarded, unless prior arrangements have been made. The NMFMA offers noncompetitive grants of up to $500 to member markets in their second year of operation in or adjacent to areas with high obesity/diabetes rates, Food Deserts and FAR Communities. These grants are intended to assist with the start-up costs of opening a market and may be used for any expenses relating to building the capacity of the market, such as signage, an information table, buying a fire extinguisher or hand washing station, etc. Up to $500 is available for second-year markets. To be eligible to receive this funding, markets must be in their second year of operation and members in good standing of the NMFMA. This includes paying membership dues, submitting the market's membership form by May 1st, and providing the previous season's market data by December 31st. in or adjacent to a "food desert"
For Food Desert designations: The Food Access Research Atlas. Click on the map and zoom in to New Mexico, then click on your county (or click "Find Address" on the top of the map and enter your market's location). If your area is in a food desert, the pop-up tract summary will say "yes." Your market may also be adjacent to an area with "food desert" designation. For FAR Community designations: Frontier and Remote Area Codes. You will then want to download the Excel sheet containing FAR codes and related data by zip code. Search for the zip code in which your market is located. If a (1) appears on any level, your market qualifies. For obesity designations: Obesity Rates Among Adults by County. Find your county on the map. If the obesity rate is higher than 28% (the New Mexico average), your market qualifies. Payment: Expenses are generally paid on a reimbursement basis. If your market is not able to cover the upfront costs, you may have the vendor bill the NMFMA directly. Please contact the NMFMA in advance so that we know to expect the bill. We like to receive these bills promptly to maintain good relations with vendors. Deadlines: Grant applications MUST be received by April 1st of a member market's second year of operation (exceptions are possible). We prefer to provide reimbursements in one or two payments. All funds must be spent and submitted for reimbursement by November 15th of the year awarded, unless prior arrangements have been made.made.